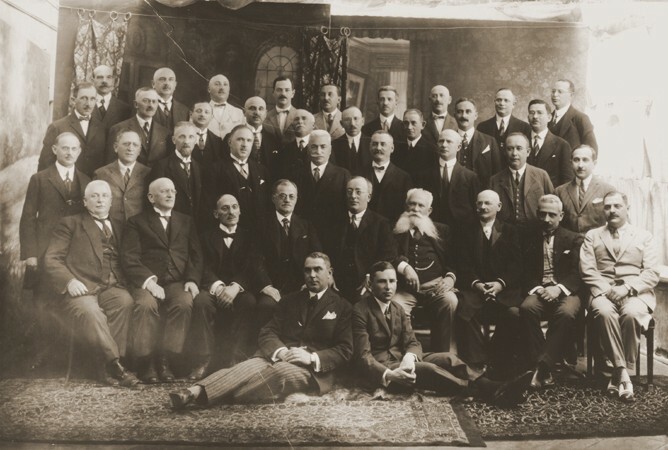 Group portrait of members of the Freemasons Lodge of Chernovtsy, Bukovina, approximately 75 percent of whom were Jewish. The members were mainly intellectuals and leaders in business and local government. Among those pictured are Dr. Max Ennis (top row, third from the left); pharmacist, Dr. Abraham Guttman (top row, far right); an official in the revenue service, Dr. Max Gottfried (second row from the top, sixth from the left); and the judge, Dr. Jacob Rubel (third row from the top, far left). Chernovtsy, Romania, 1920–25.